Moments of Discovery # 8: What’s Inside Mom’s Buffet? Mother’s house on Anchor Road has been sold. We sold it last fall, just a year ago. After more than seventy years, the Longeneckers do not own this house. So, memories and photographs remain. Mother’s dining room buffet sat at the center of our house, yes at the heart of the first floor. On top of this piece of furniture you could even hear the heart beating where the clock ticked and chimed every fifteen minutes. Mother’s hands must have removed the white crocheted doilies and dusted the buffet top with lemon Pledge and an oily rag many times. I don’t remember her doing it, but I do remember that I did every Friday. 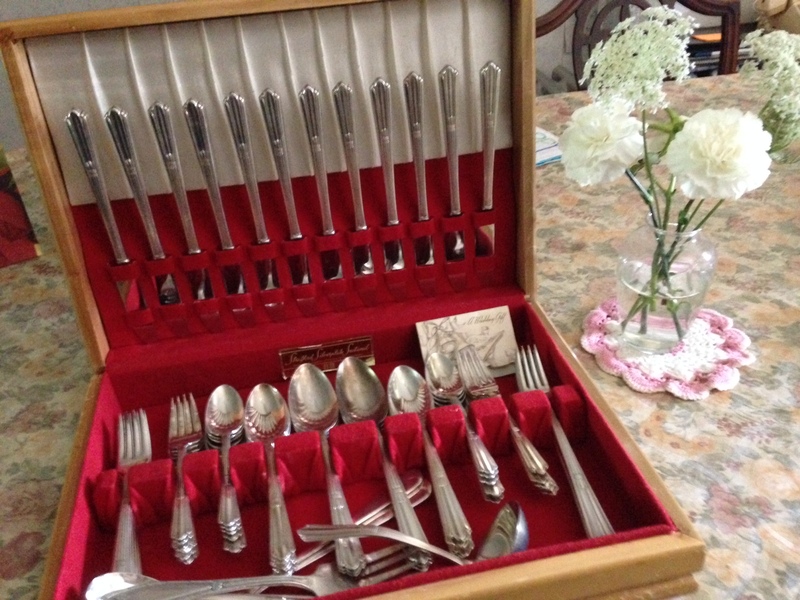 Inside the buffet were treasures: the good china and table linens, her silverware arranged in a blond, wooden box in the middle to bottom drawers. With the crystal in her china closet, Mother had all the accoutrements to entertain friends or relatives with an elegant Sunday dinner every month or two. At the top right of the buffet was a drawer that we opened/shut several times every single day. The partitioned drawer made of mahogany wood and lined on the bottom with maroon velveteen was always arranged the same. * The keys to the buffet & china closet sat inside a shot glass, scored at the lip, an odd object in a plain, Mennonite household. Mom had no scissors in a knife block. In fact, she had no knife block. The scissors in the dining room buffet was her all-purpose go-to, cutting fabric, gift wrap,or curling crinkly ribbon. The scissors was rather fancy with engraved ornamentation with a provenance from England hinted at by the letters E-N-G and a faint letter L remaining. It is probably made of steel, but since it is so tarnished, perhaps silver. 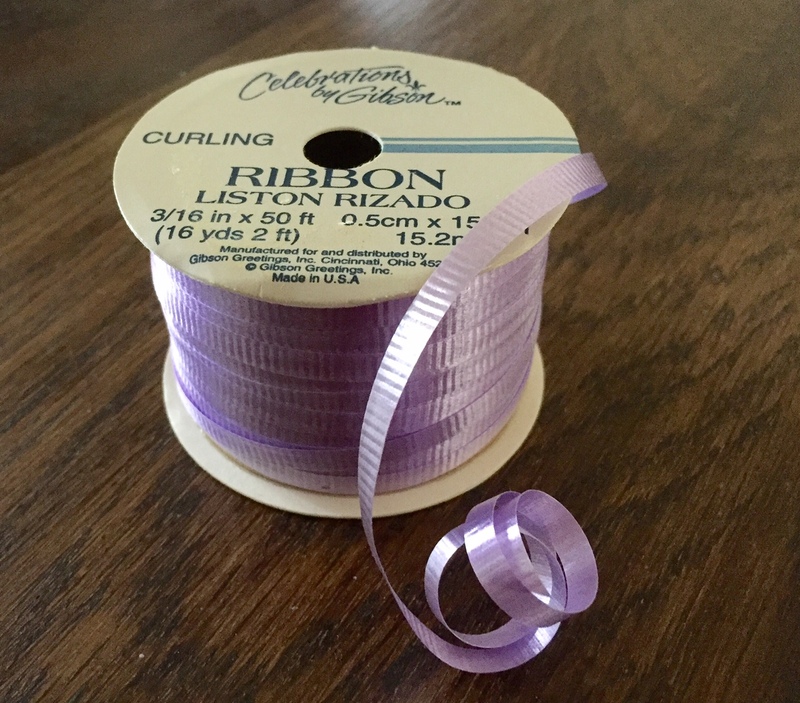 Mother drew the scissors’ blade along the length of crinkly ribbon, gathering several strands to make bows of blue, yellow, pink, or lavender for birthdays or a baby gift. During this season of the year, the fluffy bows made of bunched up strands would all be brilliant red or forest green. On the top left drawer of the buffet, Mom kept stationery, little notes to say thank you, send well wishes or remind the receiver of her strong faith. Peace on earth and good will toward men, women, and children everywhere. Is there a special object or piece of furniture in your family you want to hold onto? One you plan to pass on to the next generation? My husband and I went to a lovely Christmas dinner at the home of a church friend just last evening and I was admiring her lovely buffet in the dining room which, for the evening, truly held a lovely buffet meal. Did the top of your mother’s ever get loaded with food or was it mostly used for cards and clocks and such? I love knowing the utility items kept so handy in that top drawer, and your job polishing the top. 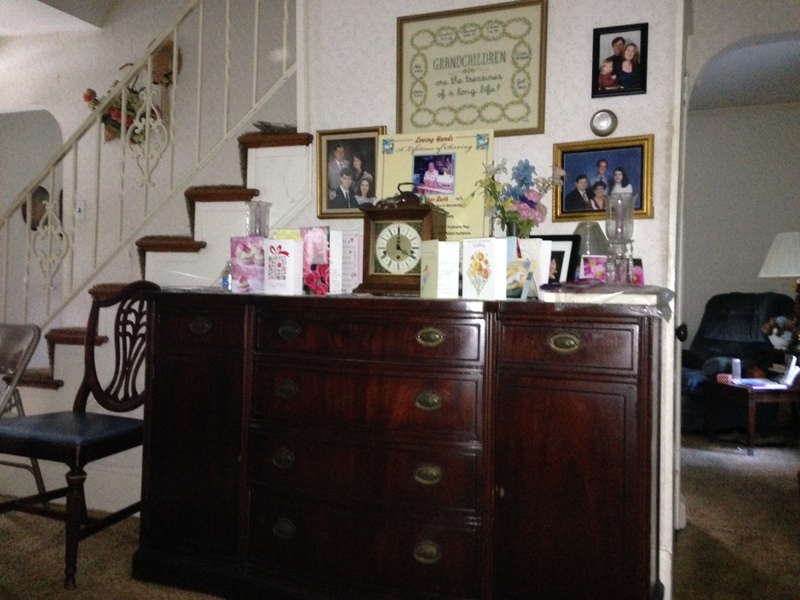 Mom had a buffet piece of furniture but I’ve never had one–no room, really. She still has the tall “secretary” desk I loved as a child — which I wouldn’t mind getting my hands on some day; it held the scotch tape, scissors, and stamps and had little secret compartments that I loved. Have we discussed that here?? Anyway, you always trigger fun and special memories. Oops, a few too many “lovelys” up there. I didn’t notice – too many “lovely” details, Melodie. I don’t remember any food items placed there. The buffet top was always arranged symmetrically, just for “show” in later years with glass candelabra at each end and the clock plumb center. Aunt Ruthie has a tall secretary of walnut similar to the one your describe. It’s the sort of thing that writers like you would appreciate. Maybe it will find a home in your house some day. Do you continue to dust your home each Friday? I think today’s generation may have neglected that task. My day for dusting was Saturday. Monday was for washing clothes, Tuesday for ironing. Yes, I do have a piece of furniture that will be passed down to following generations. Hope they care for the memories of the past as we have. 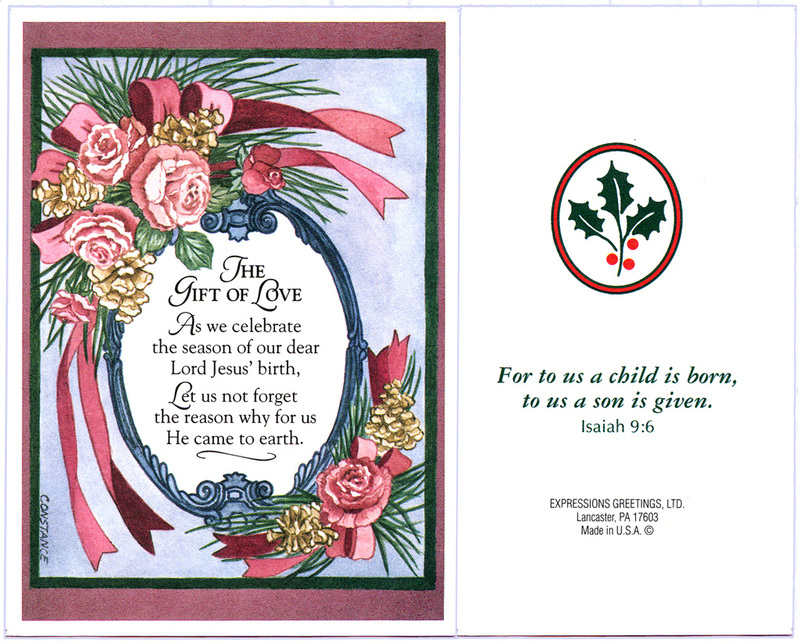 Thank you for connecting me with your mother and one of her cards this Christmas season. Kicking off the Downton Abbey season with you and your sister, and of course Cliff, was great fun. Like in your household, each day had a “flavor” which never, ever varied. I think the expectation for each day gave housewives and thus families a life that was rooted in stability. Do I continue the every Friday tradition? Take a wild guess, Carolyn! In addition to the weekly Friday cleaning, Mennonite housewives had spring and fall cleanings too. I remember the women comparing notes about their progress, “Did you do your spring cleaning yet?” Then some would gloat and others would feel bad about their falling behind and not measuring up. We were definitely the “downstairs” in Downton Abbey. No maids for the Longenecker (or Felts) family. Ha! Another lovely post, Marian. I love how you went through each part of the buffet to unwrap its contents and memories. We have my mom’s big “breakfront”, where we now store our china and crystal, along with cloth napkins and other items. We also have the baby grand piano that was in my house growing up. We have china from my mom and dad, and our girls have a set from my mom, but it is still stored at our house. Yes, “breakfront” is an alternate, perhaps more progressive name for Mother’s buffet. About the details: Now that I think of it, my most recent writing coach has emphasized using visual images. I was probably unconsciously hearing his voice in my head as I wrote. Ah, the challenge of passing items on to our children. When the children all lived in Chicago, there was a lot of their “stuff” here at home. Still, I know the challenge of getting their items transferred out of your house. One day . . . ! Mother gave the piano to a niece’s family whose daughter wanted to take lessons. I missed it when we visited home in later years, but when we cleared out the house, it was one less think to worry about. I’m glad you have the baby grand to make music and remind you of home. We actually have a buffet that was left at our old apartment. My husband refinished it. The breakfront is mirrored piece with glass shelfs that sits atop drawers and a cabinet. There’s no room to place anything on top. Your visual images came through! Thanks for the comments and pictures. I remember being in your house a couple of times. Memories are such a precious thing we take with us. And you are one of the few who can picture our house inside and out. Thanks, Shirley! What wonderful memories and mementoes you have! I love the fact that your Mum did Crochet, as so do and I am never without a project. 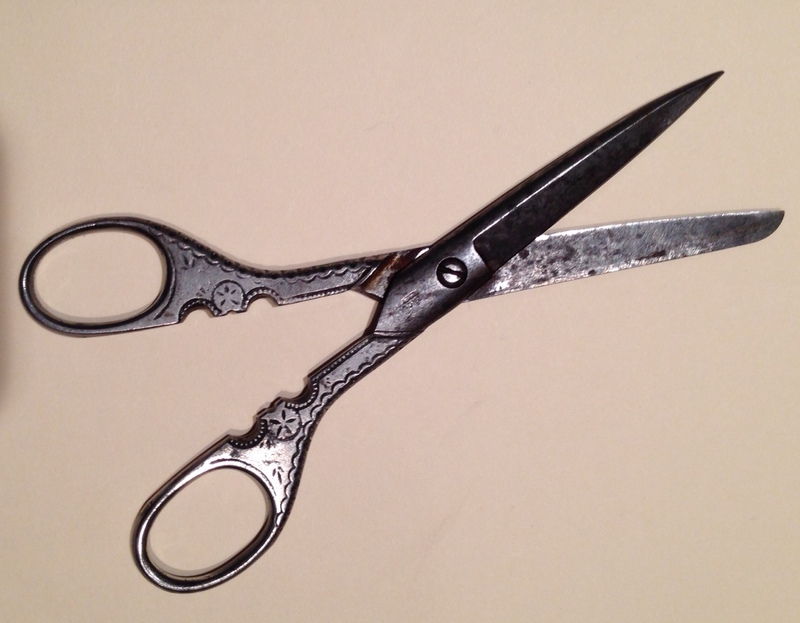 I also like those English scissors: they really belong in a museum, just beautiful! I feel the urge to travel now. I would imagine you will enjoy many Christmas displays in France and Germany this season. Crochet is a very portable and relaxing activity “on the road.” Good for you, Fatima, and safe travels! You asked, “Is there a special object or piece of furniture in your family you want to hold onto?” Not fancy in any way—a simple plate with fruit painted on it—I’d enjoy having that piece. In my crystal ball, I see you receiving that fruitful plate with gratitude. Simple can be glorious and your anecdote here made it seem so. But Mother loves china and entertaining was her forté as a housewife, so all of us have some objects from our home. I got a crystal bowl and a double candlelabra. I also have a bookshelf one of my uncles made in high school. My daughter received an antique cedar chest that dates back to the 19th century. My mother still has most of her furniture in her large apartment at Landis Homes. We want her to enjoy her own things as long as possible. I think your mother was a creative soul and would rather devote her time to cooking and decorating than to janitorial tasks that have to be done over and over and over . . . . Thank you for naming those significant objects from home that have been parceled out; I can picture each of them. And how sweet of your family to enable your mother to be surrounded with home-y objects. Oh, Marian, after I moved our parents into an assisted living apartment, it also fell on me to clear out the home they’d owned for 58 years because the others said they “just weren’t good at things like that.” Like any of us would actually find a talent for doing this kind of work. Any way, as grueling as that 3 1/2 week process was, there was also one day of quiet joy as I unpacked boxes stored in the attic and discovered two christening dresses, handmade tiny baby shoes with their names and date of birth embroidered on the bottom, two hand quilted baby quilts, etc. So many memories, but by then my dad’s Alzheimer’s and my mom’s dementia had compromised their abilities to identify or share stories to go with the things I’d unpacked. The excuse “I’m just not good at things like that” is right up there with “I can’t stand to see him/her suffer” as a way of getting out of caring for the needs of an aging loved one. Of course, there are limits. I’m sorry your had to clear out the family home all by yourself. Even with my two sisters helping, it took almost a month of arduous, emotionally-charged work. The artifacts and mementos you describe were a significant reward, however. One day you may have to make the hard decision as to whether to pass these on to the next generation or assign them to a museum. We did both. Some many, many Bibles! Thank you for accompanying me on these visits back into yesteryear. I feel the same sense when you give us “tours” of your personal life, past and present on your blog posts. Thank you for the compliment, Anita. A spinning wheel from Norway! Right away images from the story of Rumpelstiltskin come to mind though I doubt the story’s origin is Norwegian. “hiareth” – what a great word, packed with such so much meaning. Yes there are several places I’d love to return to. It’s never too early to begin to sort, categorize, and assign items you love to new homes – mentally at least. About the photographs. That’s a tricky one since I suspect like me you began with photo albums. (I admit to having 20+ thick ones.) Thanks goodness, the digital age came along – no more prints, just online collections. Yes, “hiareth” is a word I learned just recently, a joy for wordsmiths like us. My son Joel is good with digital stuff. I hope you have a counterpart in your family. If you are talking about making glossy prints for other relatives, you may have to give up on that – ha! How beautiful, Marian, the words and the photographs. So many memories stored in these simple treasures, aren’t there? I love thinking about our foremothers caring for these things we now hold dear. I feel the same way about my mom’s China and silver that I have tucked away and that (O happy day!) my little granddaughter has expressed interest in. And that word–hiraeth–it keeps coming into my awareness so often these days. I guess it’s our stage of life, able to look upon two generations coming after us, that prompts such appreciation. I remember seeing photos of that little darling, as I recall a red-head. If she is like her gardener/writer grandmother, she will enjoy preserving the fruits of the earth as well as the joys of reading & writing. Thanks for chiming in here, Linda. What beautiful photos Marian . That highly polished piece of furniture is so lovely but doesn’t seem fashionable these days …if we could hang on to them I’m sure time will bring them back . Such ornate scissors , they came from England ? I wonder where in England . I can not think of anything material that I wish to pass on for future generations , just words , phrases , mantras . Things my grandparents , aunts , uncles , parents have said to me, that meant nothing at the time but are now golden nuggets that are priceless . You are right about the mahogany buffet. It seemed too pricey to transport it to Florida, and Regency-style furniture is out of style these days. About the scissors – It definitely came from England, but according to my sister the other markings were indecipherable, so I can’t tell you any more. Sorry! These words, phrases, and mantras you are passing on to your children are far more significant than material possessions. They are fortunate to have you passing on family heritage. The love drips off your words. What a great way to remember your mom, the home she loved, and this time of year. And yes to holding on to these memories, including just the way your mom curled the ribbon. Great photos as always. I want to give each of my sons one of their dad’s tools this year. I’ve done that in the past, but it’s good to keep it going. I have to ask my helper if there are duplicates of tools or ones he doesn’t use. I know I have two adjustable screwdriver sets in Vic’s small indoor toolbox. That’s one to give away to my city son. I didn’t know the word “hiraeth,” but now I do. It rattles deep in my half Welsh bones. Thank you. Oh, Elaine, I’m so glad to see the words “my helper” as you categorize and select tools to give to your boys, a lovely tradition. I’m a country girl with rural roots, but the idea of rooting through tools all by myself for any reason feels overwhelming. I can’t tell where my eyes latched onto the word “hiraeth,” but it was recently and I immediately connected it to my state of mind this season. I miss my mother terribly. As you do Vic . . . Thanks for taking us through your old home. I love that word hiraeth. I have that disease, lol. The picture of you is beautiful Marian. Sometimes it’s nice to go back with pictures. Sometimes, not always. I’m glad you have so many wonderful memories. I had thick hair and eyebrows then and thin body. Things have reversed themselves since then – ha! So glad you enjoyed the Department of Interior tour of Mom’s buffet. There was also a messy drawer which I didn’t mention. Every home has one (or two). Your comments always welcome, Debby. It could be worse – ha! When I looked at that photo of your younger self in front of your parental home, there was about as much snow as we had in Winnipeg Manitoba in these last two days. I have to do all the shovelling now since my husband has “cold agglutinin disease” and can’t be out in the cold. I shovelled twice yesterday and twice today. It’s good exercise and hopefully will give me good muscle tone, but so tiring! I liked the new word I learned today (thanks to Shirley Showalter who mentioned it in her blog.) because I have left many homes since I was a baby of 5 months. My heart yearns for all of them, but I think I learned to make each new home a place of comfort and peace, as was your childhood place. Elfrieda, welcome! I have seen your insightful comments many times on our mutual friend Shirley’s website. Thank you for reading and replying here. I found the word in my reading a few weeks ago and discovered it resonated with my thoughts of home these days. 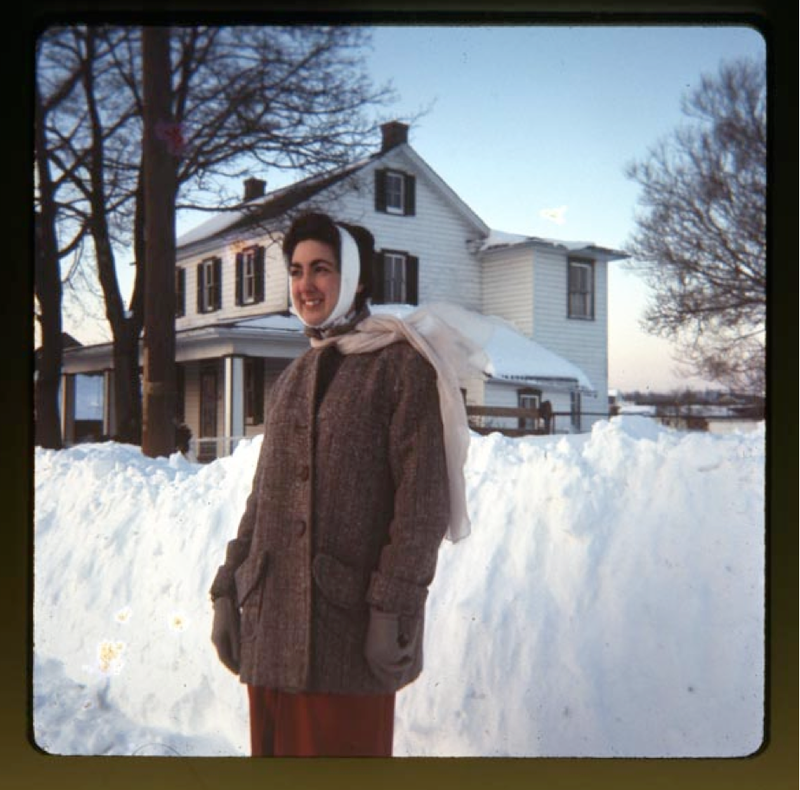 Every ten years or so Pennsylvania would get a blizzard with drifts as you see in the photo. It sounds like you are keeping your muscles toned with snow shoveling too, but take it easy – it’s strenuous work! Again, welcome, Elfrieda. I hope you’ll visit again soon. So glad I have finally found a word for that feeling I have had after leaving each of my homes, beginning when I was a five month old baby. However, I learned from my mom to make each home a place of comfort and joy! As for all that snow on the picture of your childhood home, you should see what we got in Winnipeg, Manitoba in the last two days. Had to go out and shovel the drive way twice every day. What a workout! “Hiareth” is such an excellent one-word description of that ache we can translate into a longing for home and the memories we retain. The word even sounds a bit like “hearth” as in the expression “hearth and home.” I spot a heart in the word too! I see you are now following my blog. Thank you, Elfrieda, and welcome! I have tried several times, but don’t seem to be able to post a comment. As you can see, both of your comments have appeared here. Because you are a first-time commenter, WordPress requires that I approve your posting before it can be displayed. Now that you are approved, you should not have this difficulty again. Sorry for the inconvenience, Elfrieda. Sweet memories – looks like a lovely house. Thank you for noticing, Fiona. After I linked one of your recent postings to Facebook, many of my readers enjoyed the sunset. You are so good at spreading joy, peace, and wonder. What a wonderful home! Not to mention all the treasures it holds, if only in pictures and memories. You are blessed, Marian. Thank you for sharing all these wonders with us. Happy Holidays! Yes, I count my blessings every day in my gratitude book. The inspiration in your blog posts is another thing I am thankful for. Happy holidays to you, including a wonderful 2016, Dorothy. Beautiful reminiscences of something so personal to you. These memories can be so much a part of each one of us that they live and die with us. And they somehow symbolize a unique mix of happiness and sadness, do they not? Thank you for sharing something so personal with those lovely photographs. Welcome to my blog, and thank you for posting a comment here. You are right, the objects and the memories of loved ones they represent are bittersweet. I’m glad you enjoyed the photos too. Do visit again soon, Shakti. I missed this one but love it. I understand the feeling of hiraeth. Thank you for catching up here – always appreciated, Darlene!